Raed is responsible for managing and directing the Mega Projects division at Optimiza. He holds a Master’s degree with distinction in Management and Business Administration (Strategic Management) from Maastricht Business School, Holland, and a Bachelor Degree in Electrical Engineering, with a specialty in computers, from Yarmouk University. 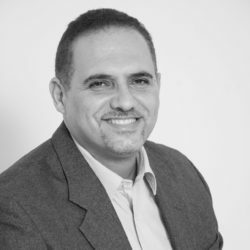 Raed has over 28 years of experience in IT (hardware, software, and networking) across the MENA region, covering all areas of business development, business consulting, IT infrastructure, and contracting projects. He has successfully executed and implemented several notable mega-scale projects, including for the Princess Noura University for Girls in Riyadh with the Consolidated Contracting Company. He also worked as the Operations and Business Unit Manager (Deputy General Manager) at the Kuwaiti Digital Computer Company.